This post continues the analysis, of Ontario electricity sector data, that is loosely guided by Chapter 6 of a recent study from the Oxford Institute for Energy Studies. Previously I demonstrated what typical wind production will look like in the coming years. Now we’ll look at the overall supply picture in an Ontario context. Ontario’s electricity system is characterized by a very large nuclear component, and a significant hydro component that generally lacks reservoirs. As demand has dropped in recent years (it peaked in 2005), intermittent sources have come into the generation mix on a ‘must take’ basis. I’ll address the current mix this has left us, and the issues already apparent in Ontario due to that mix, before forecasting some figures for future years. My starting point for modelling consumption is hourly generation data for 365 days beginning September 15th, 2010. 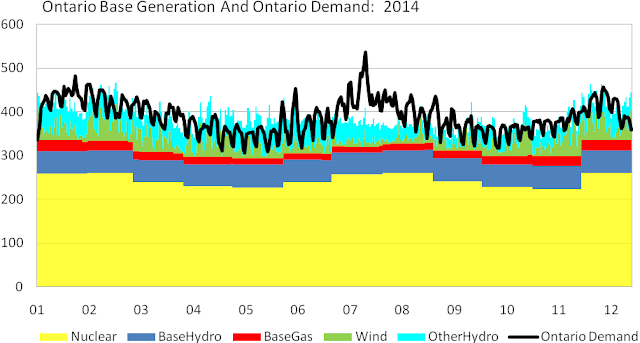 During this timeframe it’s important to note that Ontario consumed about 142.1 TWh, but generated about 153TWh. The Hourly Ontario Energy Price (HOEP) average is $32.76 over that time, so our current export levels are driven by a supply mix issue - not profits. My evaluations do not incorporate exports. 142 TWh is approximately what Ontario's consumption was in 1989 - my evaluations do not incorporate increase/decreases in demand. This graph is formatted to mimic the graph on page 67 of the Oxford study, which is grabbed from the screen and presented here as “Figure 39.” I’ve copied the colours, units and stacking order. It's a rather stunning difference! In Ontario we have one of the lowest emissions intensity generation systems on the planet, characterized by a large, inflexible nuclear component and a large hydroelectric component (shown at 110 g CO2 eq / kWh in the 2009 Canadian GHG Inventory reporting). In the UK they run baseload coal and have a large natural gas component. 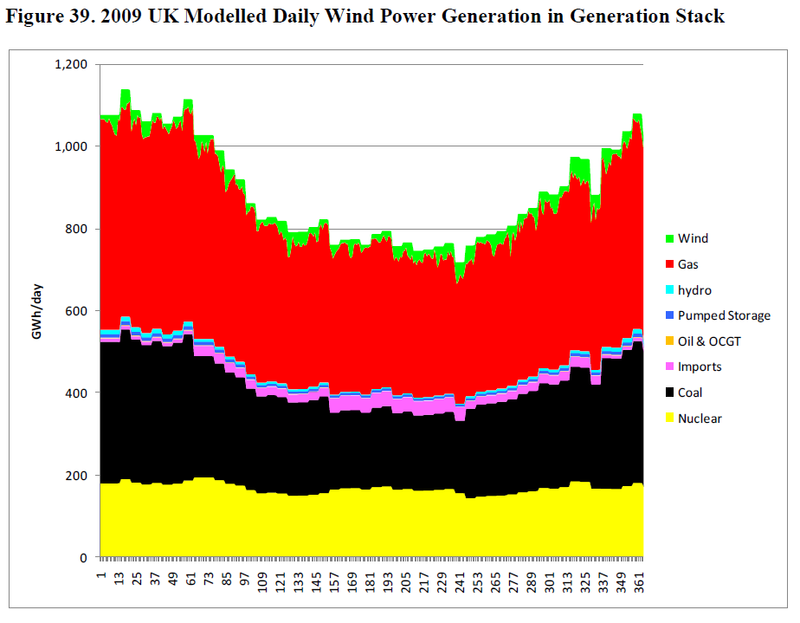 The Oxford study, forecasting out past 2020, concluded “the demand for gas is remarkably robust” despite enormous growth in Industrial Wind Turbines (IWT’s), due to both “the inherent need for gas to provide flexible balancing for wind and the significant variability of wind generation,” and a void left by retiring coal-fired generation. 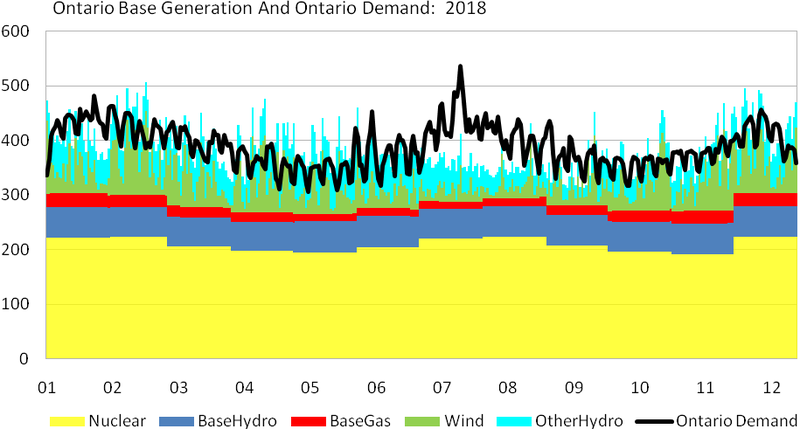 In Ontario, the question is will increased industrial wind turbine (IWT) capacity necessitate replacing existing low-emission baseload sources (nuclear), with flexible high-emission sources (natural gas). These are daily totals, masking much of Ontario’s problem of surplus baseload generation (SBG), which is far more pronounced between midnight and 6 am. Regardless, anytime the supply bars exceed the height of the black line representing demand, Ontario is a net exporter. April 7th is the only day on this chart where Ontario was a net importer of electricity. I want to concentrate on the graph below the red, natural gas generation, bars. This represents supply that is either baseload, or the category I’ve title “OtherHydro” which is included because it is assumed it will be utilized, having no incremental emissions, or any cost of production. What is particularly interesting, and indicative of a very damaged market structure, is the largest white space, between the base generation bars and the demand line, matches the lowest commodity rate of the year concurrent with July's heat; and the excess of baseload seen from the middle of April right through the lower demand spring season, matches the highest price of the year. I think it is evident it does not pay to commit to too much supply. This is the view I wish to replicate in communicating the forecast for future years. It seems to me we want to fill the white space with a cleaner supply, without going over the black demand line. Forecasting doesn't bear that out. Pickering, and Bruce A units 3 and 4 have work done to extend their operations prior to the major refurbishments beginning in 2015 (the equivalent of one Bruce reactor is planned offline following the return of two other Bruce reactors in 2012). This is one scenario that is plausible. With some question as to Pickering, it’s the scenario from the government’s long-term energy plan tinkered with due to other information including the Ontario Power Authority’s documents related to the Integrated Power System Plan development. Baseload hydro is taken from IESO 18-month outlook, by working with figures from the 10th week of 2012 and going through the 9th week of 2013. The figure is adjusted proportionately with the increase in hydro supply in the years up to 2022. The ‘OtherHydro’ category is also adjusted proportionally. The wind process is the same, and unchanged from yesterday’s post. Notably absent is solar output. The reason is I simply have no data to forecast ouput with (if you have estimated capacity factors by month and hour of the day please email them, and I’ll find some time to add the figures) – the reason I find that acceptable is generally the SBG hours are at night, and solar will be more related to issues of peaking, and the utilization rates of natural gas facilities. Both are important to pricing, but beyond the scope of this post. By 2014 my forecast has about 300MW more hydro capacity, 765MW more nuclear capacity, and about 2000MW more wind capacity (most of these are based on OPA reporting). This mix pushes these sources up to supplying most of Ontario’s demand with the exception of some cold winter days, and, primarily, the heat of July. In 2014 the expectation is that exporting, or dumping, is necessary much of the time, and is likely to be accompanied by paying generators to curtail supply (I wrote on some methods the IESO currently has to curtail supply here). But the amount of demand space needing to be filled, most likely by natural gas generators, has shrunk. By 2018 nuclear capacity is reduced 1750MW (from 2014 levels) , due to refurbishment activities, while hydro increases by about 700MW and wind by another 3000MW. Despite adding about 2000MW of supply, more white space on the graph indicates more peaking supply is needed. Similarly, the erratic nature of wind supply results in far more ‘baseload’ supply than demand is expected to be able to handle. Things don't change much between 2018 and 2022. When the final 3 refurbishments return to service, Pickering is retired and that likely will be a trade-off (Bruce and Darlington units have had much higher lifetime capacity factors) - so the 2018 graph likely won't change very significantly. And that would then remain substantially true through at least 2035. Looking at the chart for today, it doesn't seem that daunting a task to fill the gaps with cleaner supply. Looking at the chart for 2018, it doesn't seem that was the task we addressed. The task we addressed was adding more renewables - but we can't demonstrate why. "...we should ask ourselves what our aim is. Is it to stop climate breakdown, or is it to engineer the maximum roll-out of renewable power? Sometimes it seems to me that greens are putting renewables first, climate change second." Valuable information. Lucky me I discovered your web site accidentally, and I'm surprised why this twist of fate did not happened in advance! I bookmarked it.